If you bookmark the website address, each time you want to enter information, you can simply go to the bookmark link and click it to be taken directly to the login page. This saves you time you don't have to remember the address. 1. When you are on the Login Page go the the Bookmarks Menu on your web browser. Click on "Bookmark This Page" (as shown in the image above) and then save the address in your bookmark files. 2. The next time you are on the internet and you need to enter your information, go straight to your Bookmarks Menu and select the your link e.g. "Login II Performashield" to be taken directly to the Login Page. 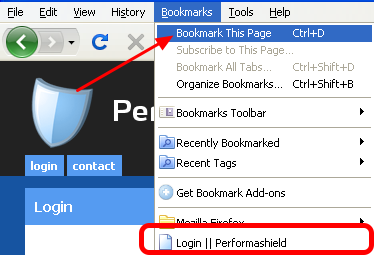 The image above shows that the Performashield site has already been bookmarked and is available to click on. Once a your site address is book marked, it will appear in your bookmarks list.